SweetRush’s creative and innovative mobile and video learning programs impressed the judging panel in the prestigious and rigorous competition. SAN FRANCISCO, Calif., July 17, 2017 — The Summit Creative Award competition recently announced its results for 2017, and SweetRush was named a winner in two categories, educational video and multimedia. Including this year’s awards, SweetRush has been honored with a total of six Summit awards. Previous honors include wins in the categories of video and interactive media and a Platinum award for education marketing. This year, the Summit Creative Award received more than 5,000 submissions from 24 countries, and all projects were reviewed by a panel of international judges that included professionals in Australia, Canada, Chile, Japan, South Africa, and the United States. 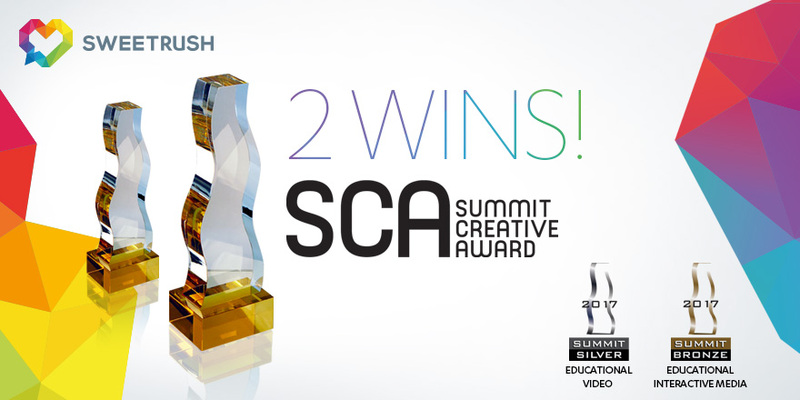 The Summit Creative Award (SCA) recognizes and celebrates the creative achievements of small- and medium-sized advertising agencies worldwide with annual billings under $30 million. Celebrating its 23rd year, the SCA has firmly established itself as the premier arbiter of creative excellence for firms of this size and has become a coveted honor. The Summit International Awards (SIA) is an organization founded in 1994. Each year, it conducts the Summit Creative Awards, the Summit Marketing Effectiveness Awards, and the Summit Emerging Media Awards. Additional information about the Summit International Awards organization, its competitions, and winning firms can be found on the SIA website.